When remodeling a kitchen or building a new house, it is very easy to spend anywhere from $20,000-$40,000 for kitchen cabinets and countertops. While the price of granite, laminate, or whatever surface you choose is going to be close to the same price no matter where you shop (unles you have a connection), kitchen cabinets can vary greatly in price. While the name brand cabinets can offer a wider range of styles and accessories, you can still build a great looking kitchen (and save thousands of dollars) by buy RTA or Ready-to-Assemble Kitchen Cabinets. Most people hear the words Ready-to-Assemble and they think cheap looking and cheaply made cabinets… while this may have been the case a couple of years ago, improvements in the manufacturing processes and quality control have created a cabinet that in many ways can be better and stronger than the name brand kitchen cabinets. Let’s compare the traditional kitchen cabinets sold at Lowes and Home Depot versus RTA Kitchen Cabinets. Materials: While both types of kitchen cabinets will have solid wood face frames, the big difference will be in the sides and back of the cabinet. Many of the name brand kitchen cabinets use particle board or fiberboard for the sides and back of the cabinets, while most of the RTA Kitchen Cabinets use plywood sides and solid wood backs. Needless to say, this makes for a strong cabinet, plus they are less apt to bubbling or warping from water. The sold wood and plywood makes for a sturdier cabinet when mounted. Assembly: Traditional cabinets have a wide range of methods for holding the cabinets together: anything from staples, to wooden dowels and glue on the higher end cabinets. While there are a couple of assembly methods on Ready-To-Assemble Kitchen Cabinets, the most common method is a cam lock system which only requires a screwdriver for assembly. So when you are shopping for Kitchen Cabinets, whether it is for a new kitchen or you are remodeling an old one, there are other options out there that can save you money (and a significant amount at that). Many retailers are selling their cabinets on E-bay, which can save you some money, but if you are looking for a true savings your best bet is to find an RTA Kitchen Cabinet distributor that is also an importer. There are several of them out there, but many of them will only sell to distributors. 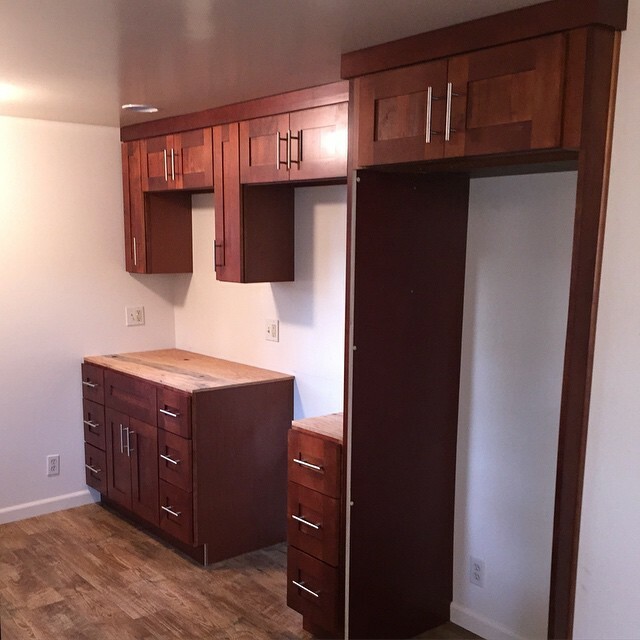 Having remodeled several rental properties, the best resource I have found for (RTA) Ready-To-Assemble Kitchen Cabinets is RTA Kitchen & Bath Cabinet Store. They carry a large inventory, ship within a couple of days, and have some of the best prices that I have been able to find. When shopping for kitchen cabinets, it really comes down to this: If you are looking for a wide range of styles and need to have the NAME to go with your new kitchen, you are going to pay for it. If you are looking for a high quality kitchen, without taking out a second mortgage to pay for it, I would do some research on Ready-To-Assemble Kitchen Cabinets.